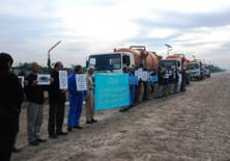 On Monday, December 1st, a number of drivers in charge of emptying blackwater tanks at Camp Liberty in Iraq protested the inhumane measures of the Iraqi security forces against the residents, which have seriously endangered their health. 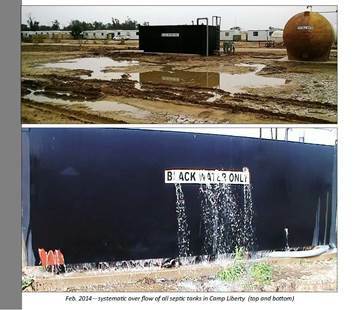 The prevention of emptying the blackwater tanks, which is a daily task, is a part of the suppressive policies and psychological pressures the Iraqi security forces are imposing against 2,700 Iranian dissidents at Camp Liberty, near Baghdad Airport. In addition to the bloody attacks and massacres, since 2009 an inhumane medical and logistical siege has been imposed by the Nouri Maliki government, at the behest of the Iranian regime, against members of the People’s Mojahedin Organization of Iran opposition in Iraq. These individuals are protected persons under the Fourth Geneva Convention. To this date the pressures have intensified. In the past several weeks, Iraqi security forces, by preventing the exit of septic trucks, have lessened their commuting. The daily commuting of these trucks is now half the needed amount. As a result, the blackwater tanks are filled and will spill over, contaminating the camp’s environment and spreading dangerous diseases among the residents. Due to the lack of infrastructure at Camp Liberty, not having a sewage system and the dilapidation of the tanks, the camp is constantly faced with the contamination of the living environment of the camp’s residents. This will cause many diseases for the residents. The camp’s Iraqi security forces have in the past two years, at the behest of the Iranian regime and its elements in the Iraqi government, used this tactic to harass the residents. Up to now this problem has resulted in the spread of many skin, eye and intestine diseases amongst the residents. The transfer of Iranian dissidents from their former home at Camp Ashraf was carried out based on the guarantees and commitments of the US Government and UN in 2012. The US and UNAMI accepted the responsibility of ensuring the safety and security of Camp Liberty residents until their transfer to safe countries. These commitments have to this date been constantly breached by the US and UN. They are turning a blind eye to the pressures imposed against the Camp Liberty residents based on a political agenda of the Iraqi security forces. The dangerous consequences of the spread of diseases amongst the residents, due to environmental contamination, are on the shoulders of the UN and US because they have a legal and moral responsibility towards the residents.